Should I try to build my own business website or hire a web design pro? A business website is a vital part of starting a new business, but web design is not in most new business owners’ skillset. The web is where people who need your services or product will first look. Your business website is where potential customers will go to find out if your business is trustworthy and offers good value. But when building a new business website, many new business owners are on a tight budget and need to prioritize their capital. Spending thousands on a professionally designed website may not be possible. So, should they try to tackle web design themselves? In 2017, it’s easier than ever to build your own website (BYOW). Great services, like SquareSpace and WIX exist offering great looking websites for a small monthly expense. WordPress is used by many pros, VAUX included, is free and allows business owners to build a powerful and full featured web dsign relatively easily (albeit while requiring a bit of technical knowledge). The options are out their to BYOW and they are great options for a business a tight budget. Working with a professional web designer allows the business owner to build a website that is more than just a presence, but is a business tool focused on business goals. For example, is your primary goal to use your website as a lead generator for sales? A pro can design the website to prioritize the most important content to capture lead information. Or maybe your primary goal is selling products online? A pro should work with you to design your website to streamline the sales process and encourage visitors to buy something. Building a website that focuses on business goals sounds intuitive and assumed, but in our experience, many websites are built without a real business focus in mind. Whether you choose to BYOW with Squarespace or hire a pro, these sites often don’t lead to business growth. Just because they exist (and even look good) doesn’t mean they work to achieve what you desire for your business. At VAUX, we approach web design with our clients’ business goals in mind. Our end goal isn’t just to build beautiful websites, but websites that work (ie. increase revenue, generate more leads). 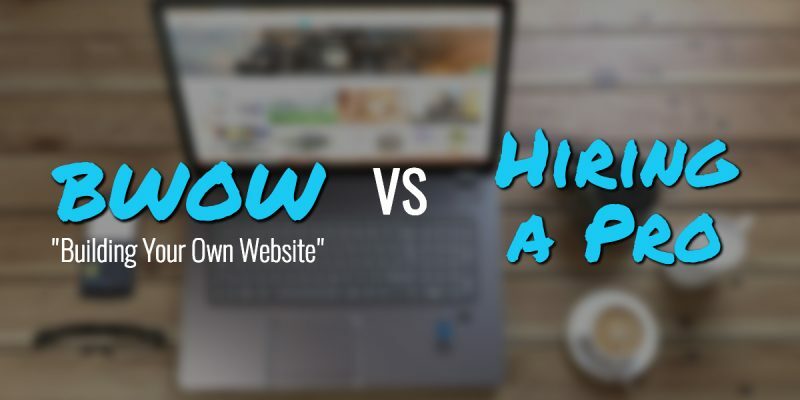 Whether you decide to BYOW or hire a pro, make sure your website achieves what your business needs it to. Let us know if we can help by Requesting a Free Quote or by emailing us at inquiry@vauxdigital.com.